The largest public domain name sale reported by DNJournal last week was Magenta.com, which sold for $100,000 via DomainNameSales.com. Although I am sure it will be surpassed because it is only February, this $100k deal currently ranks as the 7th largest sale of the year on the DNJournal year to date sales report. 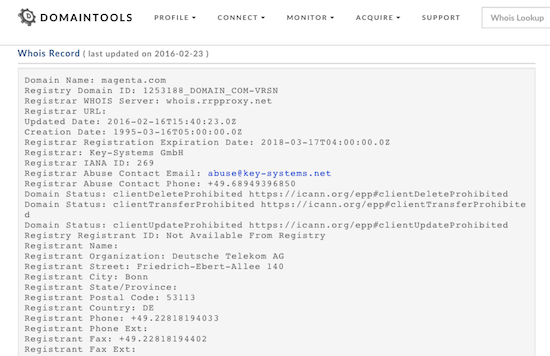 According to DomainTools, Magenta.com is now owned by Deutsche Telekom AG. If you visit Magenta.com right now, the domain name does not seem to resolve. I assume that is temporary because of the cost of the acquisition. I like this sale for several reasons. I always like to see public, six-figure domain name sales reported. I think large sales can help boost the aftermarket and show that it is healthy. It is also nice to see a keyword .com domain name sell for six figures. In addition, I am happy to see a large company acquire a domain name rather than trying to abuse the UDRP process. I highly doubt the company would have had a chance at winning a UDRP, but that hasn’t stopped other companies from trying to abuse the UDRP system. I also like this deal for a personal reason. My company owns Lilac.com and I have received dozens of inquiries and offers. When discussing a deal with prospective buyers who inquired about Lilac.com, I previously only had the $65,000 Violet.com sale as a comparable to share. I can now show them that another purple hue .com domain name sold for a 6 figure price tag. It will be interesting to see how Deutsche Telekcom decides to use Magenta.com. In the meantime, it is another solid aftermarket reference point. They are in fact naming lots of their internet/phone services & products such as “Magenta ONE” / “Magenta Basic” / “Magenta etc…” you get the picture..
Wandering what eBay has to say with their Magento TM. I am sure Ebay has nothing to say about it. Magenta is a word and Magento is a made up brand. IMHO, all is subject how aggressive the corporate lawyers are. Facebook’s ones want to go after every Face word… Some people at ICANN would find magento and magenta confusingly similar. The case is weak, and yet, some legal departments have cash to burn. I agree, it is nice to see a keyword .com sell. Lately it’s been LLL, LLLL, Chips, NNN, NNNN etc. I enjoy those domains and know they’re hot right now, but seeing keywords sell is always exciting.